Meals of Hope volunteers came from all walks of life, but many were residents of Sun City Center and Kings Point. “We have to do something for someone,” said organizer Denny Hanson. “We can do this.” And then they did. Mitch Traphagen photos. There are numerous ways and avenues for each of us to volunteer time or donate money. Some go through formal channels through large organizations; others are informal, helping a friend or even a stranger in need. Even the smallest act of good is often magnified exponentially. What comes around does tend to go around, and often in ways that may be unseen but are larger and more impactful than could be imagined. Fifty-four thousand meals is no small gesture. It will have no small impact. Fifty-four thousand meals that will be used to feed underprivileged children and struggling parents right here in South Hillsborough — the impact of that will be incalculable. And all it took was one Saturday afternoon and 250 volunteers, willing to give just a few hours of their time. And by that Saturday night, each of those volunteers was able to go to bed knowing that children, living right here, will not go hungry. Families will not be facing an empty table at dinnertime. Organizer James Wilmouth, providing instruction, encouragement and gratitude to the volunteers during the event on Saturday. 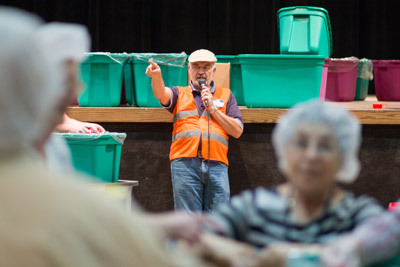 On Saturday afternoon, James Wilmouth, who spends his days as the branch manager for Encore Bank but this day, at least, as an organizer to amass a staggering number of meals for people in need, was walking around the Borini Theatre at Kings Point wearing an orange vest, ensuring that everything was running smoothly and on schedule. It turned out that things were running ahead of schedule. The volunteers weren’t alone at Kings Point. 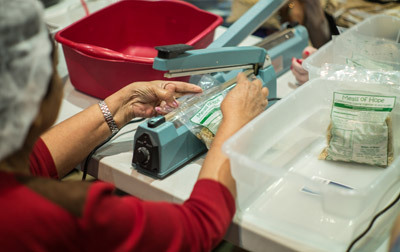 On that Saturday, across the state of Florida, there were four simultaneous events going, with the goal of packaging 400,000 meals in total. The events are organized by Meals of Hope, a 501(c)3 nonprofit organization that is dedicated to bringing communities together to end hunger. 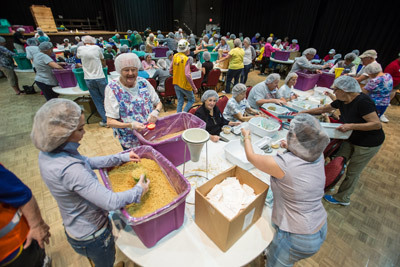 At the Borini Theatre in Kings Point on Saturday, 250 volunteers gathered to package 54,000 meals for those in need right here in South Hillsborough. The event was Meals of Hope and was organized by the Sun City Center Rotary Club, with numerous other service organizations and churches involved in making the project a success. “There is a silent epidemic happening within our country today, and although the reality can be overwhelming, Meals of Hope and its partners are making definite strides in combating hunger and food insecurity here at home,” said executive director Stephen Popper. The organization began in 2007, which is also the year that residents of Sun City Center area service organizations, businesses and churches signed on to help. Denny Hanson of the Sun City Center Rotary Club was instrumental in starting work with the project. While the focus is ending hunger here at home, there was a time when events beyond our borders were so horrific that the organization and volunteers stepped up to help, and in a big way. It is not filet mignon, but, for a hungry child, it is sustenance and so much more — it is hope. Each and every package makes the difference between someone going to bed hungry or going to bed with hope for the coming day. In a corner of the Borini Theatre, a small crock-pot was available for the volunteers to take a taste test of the food they were packaging. “It’s pretty good,” said one volunteer. It’s better than good. It’s 54,000 plastic packages of less hunger in America and, specifically, in our own neighborhoods in South Hillsborough. It is sustenance and it is hope — for ending hunger, for a better tomorrow. Indeed, there were seniors working alongside young people, there were those such as Debbie Caneen of SunTowers, too young for the community but too committed and involved in the community to not answer the call for help. There were members from the Sun City Center Leathernecks, men who know all about answering calls for help — they were all giving of themselves to help people they may well never meet. Fifty-four thousand meals. Fifty-four thousand ways to make a difference. They did it. For more information, visit www.meals-of-hope.org. The Sun City Center Rotary Club is on Facebook at www.facebook.com/RotarySCC.